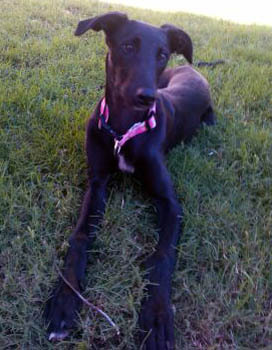 Rosie is an approximately 6-month-old black female greyhound with white paws on her back feet. 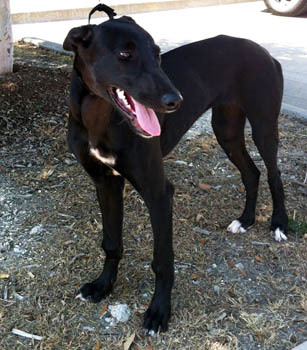 Rosie was listed on Craigslist in Oklahoma City as a give away, and she was brought to GALT by a dog lover from the OKC area. (Thank you Chelsi!) 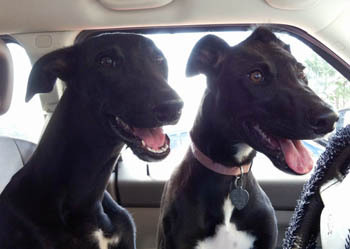 Rosie arrived with Jazzy, a stray from the Oklahoma City shelter. Judging from their age, size, and looks, Rosie and Jazzy could be sisters, but of course we'll never know for sure. Rosie has not yet been tested with cats or other small animals.